Ten years ago, Gangadhara Kotyan, 34, a 12th standard dropout, worked as a salesman in a bookshop in Karnataka's Madanthyar village for a meagre monthly salary of Rs 1,500. "We were nine children, including five girls," he says. "We had to feed them all." Today he owns a bookshop, and earns about Rs 25,000 a month. Kotyan's lot changed after he joined a self-help group eight years ago, promoted by the Shri Kshetra Dharmasthala Rural Development Project (SKDRDP), a non-profit trust widely known across rural Karnataka. With money borrowed from the group, he bought a bookshop, and developed his business. "I have been able to marry off two sisters and raise a rubber plantation, areca and coconut on our land thanks to my business income," he says. He owns eight acres of farmland now. 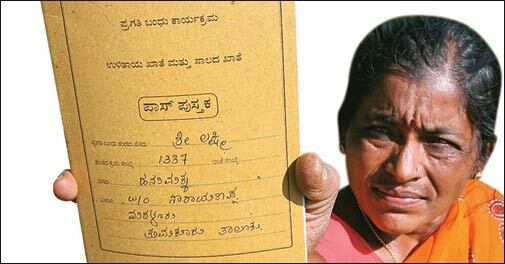 He is one of around 2.3 million people lifted out of poverty by a widespread micro credit movement, launched in 1995 by D. Veerendra Heggade, the Dharmadhikari or Chief Administrator of the Shri Manjunatha Swamy Temple, the famous Hindu centre of worship at Shri Kshetra Dharmasthala, about 77 km from Mangalore. The movement, with 230,000 self-help groups, is spread across 16 districts of Karnataka, as well as in Kasargod, Kerala, and, is poised to touch 335,000 groups by the end of this fiscal year. "What we do is not philanthropy," says Heggade. "There are hundreds of government schemes aimed at the poor, but the beneficiaries have no information about most of them. We educate them on these programmes, besides running our own." The trust has a field staff of about 6,000, all from local villages, who organise the self-help groups and handhold them on a regular basis. "They help individuals with their business plans, take up livelihood activities, but also inculcate the habit of savings and repayment," says the Trust's Executive Director, Dr L.H. Manjunath, a veterinarian by qualification. The members save about Rs 10 to Rs 20 a week, and the self-help groups keep these in their individual bank accounts. Where there are no bank branches, the trust manages them. A member can get a loan of anywhere between Rs 10,000 and Rs 3,00,000. The self-help group he is attached to provides it from its own savings - if it has enough - or with the assistance of the trust. The trust borrows from a clutch of banks at 12 per cent interest and lends to the groups at 18 per cent. The interest income the trust earns is ploughed back into community welfare projects related to drinking water, sanitation, water purification, etc. The trust has been reporting a surplus from this microfinance activity since 2006/07, earning about Rs 25 crore from it in the first half of 2012/13. "Heggade's vision is that the programme must run on its own strength, independent of support from temple funds, and make people self-reliant," says Manjunath. What if a member defaults? Usually other group members bring moral pressure on him to pay up. "A defaulter cannot be thrown out of the group," says Manjunath. "But if more than two members resort to wilful defaults, we close down such groups." Such defaults are treated as nonperforming assets by the trust, which - just like banks - makes provisions for them every year. But defaults are rare - there were none, for instance, in 2011/12. "It is due to the deep-bonding members develop with their self-help groups over a period of time," says Manjunath. Micro-credit is only one of the many programmes the trust runs to combat rural poverty. It also has an education project in which, instead of running schools on its own, it provides teachers to community schools, bearing the cost of their salaries. Initial support, however, is only for a year, after which it is reviewed. "We have 450 teachers now in schools all over Karnataka," says Manjunath. The organisation runs its own health insurance scheme as well called Sampoorna Suraksha (total protection) in which, for a premium of Rs 380 per year, a member is eligible for hospitalisation costs up to Rs 10,000, maternity costs up to Rs 7,500 and a death compensation of Rs 5,000. Around 1.3 million people are part of the scheme. The trust has also partnered with the Krishi Vigyan Kendras and various government departments to guide and advise farmers on organic farming and the dairying technologies. The trust, quite often, shares its expertise of building a community network of such massive scale by holding training programmes for other NGOs. Between April and December 2012, about 150 NGOs from across the country participated training programmes at the trust, sponsored by the National Bank for Agriculture and Rural Development. Such sharing can lift millions more like Kotyan out of poverty. Kotyan's own self help group, Sowmyashree, which he currently heads, has 10 members, all self employed like himself, thanks to the trust. The dividing line between self-help and divine intervention is sometimes thin.